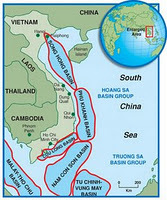 Geological surveys have identified the basins of Song Hong, Phu Khanh, Nam Con Son, Cuu Long, Ma Lay-Tho Chu, and Tu Chinh-Vung May as having great potential for oil and gas reserves. Estimates run from 0.9 to 1.2 billion m3 of oil and from 2100 to 2800 billion m3 of gas. In fact, proven reserves have been verified amounting to 550 million tons of oil and 610 billion m3 of gas. In late 2010, Dart Energy was granted an extension of its exploration period PSC for Block MVHN-01KT in the Hanoi Trough Block. In early 2011, PetroVietnam Technical Services Corporation (PVTSC) and Lam Son JOC inked an agreement for the provision of FPSO vessel chartering for a period of 7 years with an extension of 3 years. PVTSC shall manage the FPSO as well as take part in its installation.